The first shelter/home magazine dedicated to environmentally friendly, eco-conscious, green building launched in 1994. A quarterly consumer magazine dedicated to natural, hand-made crafts, foods, and story-telling. The cover of EcoCraft highlights beer and wine bottles recycled with a creative use of latex paint. See more from EcoCraft HERE. This is a spread from the book EcoCraft: Recycle, Recraft, Restyle, a compendium of recycled craft projects conceived, written, and photographed by Susan. See more from EcoCraft HERE. See more about this innovative sewing book HERE. Here is a chapter opening spread for the book Fabricate designed, conceived, written and photographed by Susan. See more about this innovative sewing book HERE. This book is full of projects made by hand with just a needle and thread. The book design reflects a very hand-on, detailed design aesthetic with a hint of old fashioned craftsmanship, made fresh and bold for the new century. See more about this innovative sewing book HERE. This is a spread from the book Sewn by Hand contains a lot of visual and verbal information carefully organized and crafted so everything has its place. The feel is vintage but with new vitality. See more about this innovative sewing book HERE. Book of holiday felt projects designed and photographed by Susan. A sampling of bag labels, hang-tags, business cards, yarn wraps, rubber stamps, etc. for the branding of artisanal textiles. 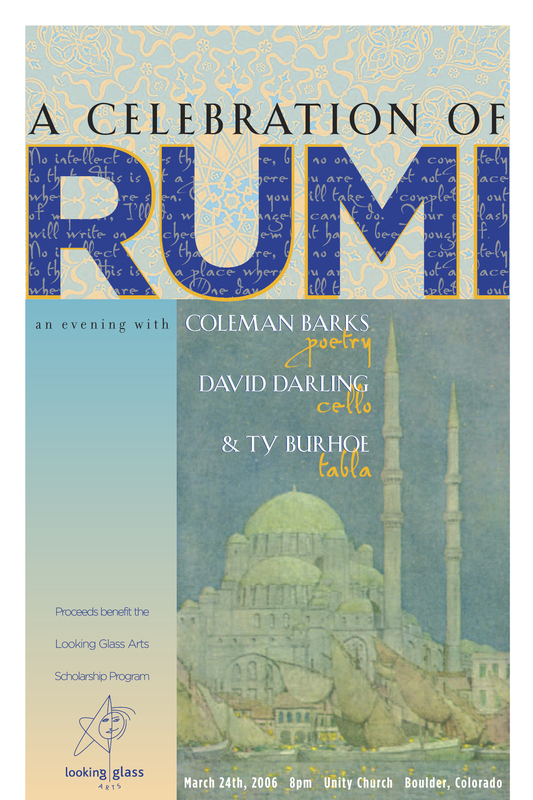 Poster and program cover for a concert featuring David Darling music and Coleman Barks reading poetry by Rumi. CD packaging for a series of spoken word recordings by Barry Lopez and Terry Tempest Williams. See more examples of CD and DVD packaging HERE. Both a graduation and a bon voyage for a new world traveller.